3. Display - 6" FHD+ display from Sharp, brightness, contrast, color temperature, sRGB coverage, etc. 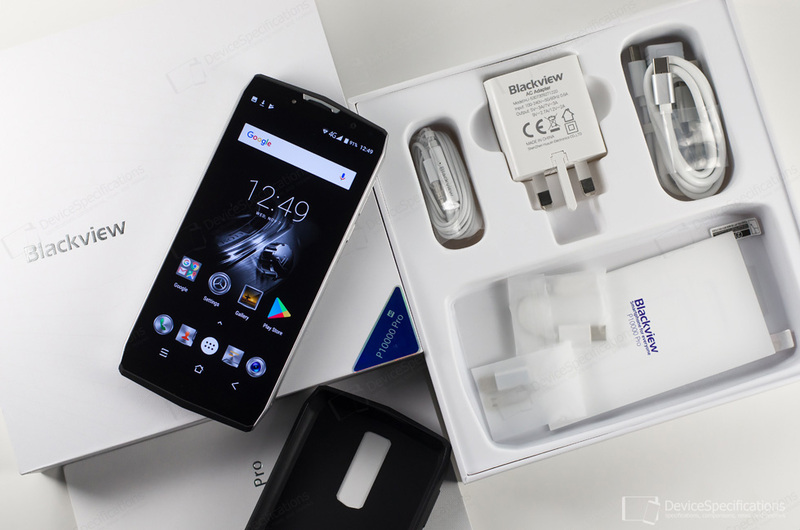 Blackview P10000 Pro is not a very new smartphone but is still worth reviewing. This is the second handset in the world with an enormous 11000 mAh battery after the Oukitel K10. Both devices feature the same displays, chipsets and batteries and it will be interesting to compare their battery lives, especially when the K10 takes the top places in all of our battery life tests. This in-depth review is especially to all those of you, who have explicitly requested a review of the P10000 Pro. So without further ado, let's start with the specifications overview and unboxing. You can buy a Blackview P10000 Pro at a promotional price from here. Blackview P10000 Pro is equipped with a 6-inch in-cell IPS display from Sharp. It has an FHD+ resolution (1080 x 2160), 1300:1 contrast ratio and 500 cd/m2 brightness. The protective glass on the screen is not specified. The model has a glass back variant using a "high definition glass" and a leather-back variant using real Australian calf leather. The frame is made of metal available in silver and black colours. Performance-wise, the model relies on a MediaTek Helio P23 (MT6763V) chipset with four 2GHz and four 1.5GHz Cortex-A53 CPU cores. A dual-core Mali-G71 MP2 GPU clocked at 700MHz handles the graphics department. There are 4GB of single-channel LPDDR3 RAM onboard clocked at 933MHz and 64GB of eMMC 5.1 built-in memory that can be expanded with up to 128GB. Blackview P10000 Pro has two front and two rear cameras, each set aided by a LED flash. The main rear shooter is equipped with a 16MP Sony IMX298 sensor and an f/2.8 lens. The main front camera packs a 13MP Sony IMX135 sensor and an f/2.8 lens. Both the rear and front auxiliary snappers use VGA sensors. The central point of the model is its 11000 mAh battery made by BAK. This is a Li-Pol high-density unit paired with a 5V/5A fast charger. The handset is equipped with a hybrid, dual Nano-SIM tray and supports the following network bands: 2G GSM (850, 900, 1800, 1900 MHz), 3G WCDMA (900, 2100 MHz), 4G LTE-FDD (800, 900, 1800, 2100, 2600 MHz). The wireless connectivity options of the P10000 Pro include dual-band Wi-Fi 802.11 a/b/g/n, Wi-Fi Hotspot, Wi-Fi Direct, Wi-Fi Display, Bluetooth 4.1. The device works with GPS and GLONASS and is equipped with a USB Type-C 2.0 port with OTG support. There isn't a 3.5 mm jack, a headphone adapter is provided instead. P10000 Pro runs on Android 7.1.1 Nougat with Blackview's overlay on top. 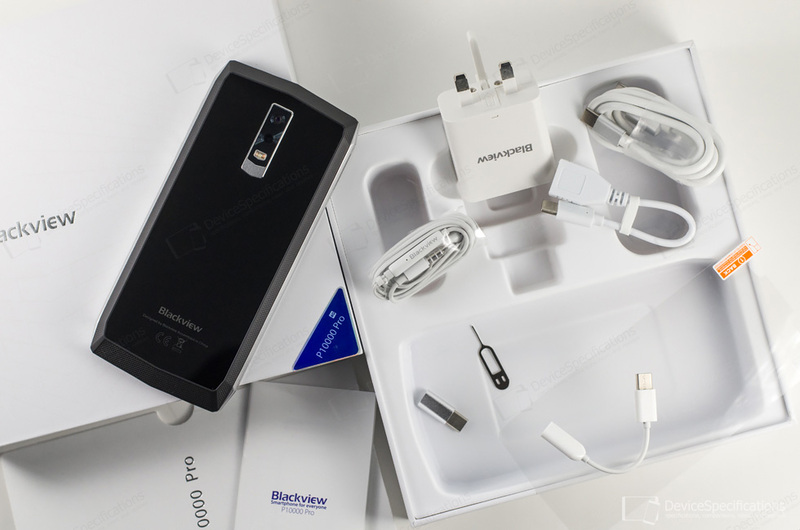 Complete Blackview P10000 Pro specifications.